It’s time to start enjoying the beautiful Spring weather, but you might want to think twice before you have a seat outside. Like most people your outdoor furniture has probably been sitting around and collecting dirt and grime. It’s time to get that furniture cleaned up. Start by setting up all your outdoor furniture outside on the lawn, then brush off all of the excess leaves, dirt and grime that have settled. Next hose down all the furniture to rinse off easily washed away dirt. Use warm, soapy water and a tough brush to scrub away all signs of stuck dirt. Instead of soap, you can also use a mixture of white vinegar and water. 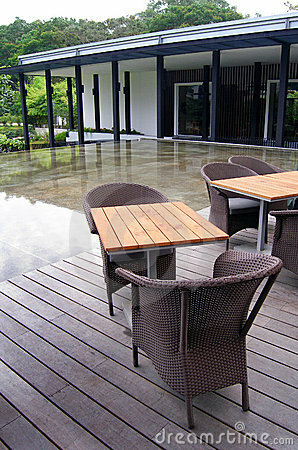 Get a special polisher or protector for metal outdoor furniture, to remove any signs of rust. Wooden outdoor furniture can be easily repainted or sealed for even more protection. Canvas coverings for outdoor furniture washes easily in the washing machine, but remember to put it back on the furniture while it’s still wet so that it keeps the correct shape. Now that your outdoor furniture is sparkling clean, you can sit back and enjoy.